Retired Freedom Seekers with a calm Lab/Beagle pet and a passion for travel, wine, friends and music. 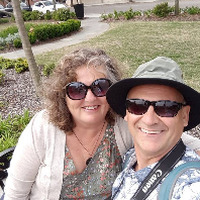 My wife Susie and I (Matthew) travel in our RV in the winter months and throughout the summer. We have both left our professional careers at 50 and enjoy a simplistic way of living. It allows us to travel, enjoy wonderful new experiences and gain the friendships of great people along the way. I am pretty handy at building things, and Susie has a keen eye for style and design so together, we bring a great balance to our efforts. Susie has a great eye for design style, and loves to cook. New to us, we are excited to explore, learn from and share our experiences with others . The maiden voyage in our RV was 5000 miles from Phoenix, AZ to Windsor, N.S. It was too fast, but enough for us to know that there are a lot of places we want to experience. 2001 Fleetwood Southwind 32 ft with a Suzuki SX4 Toad. This was our first experience using Boondockers Welcome. Matthew, Susie and Sage were delayed and could not stay over (sadly, their rig needed some repairs) but they came over for dinner and a few hours of getting to know each other. What a lovely couple and Sage was a delight. We were even able to celebrate mutual birthdays together. They are welcome back anytime! A pleasure to host the WineSprinters! Can't wait to actually meet them in FL next winter and see if they live up to their name. Hopefully we can keep up with them! Very nice couple. Had a great time with them. Would host them again. Enjoyed having them with us. I only got to spend a few minutes visiting with them but a lovely couple and their dog. They are welcome back anytime. Wow! What a great time with this couple! What an awesome couple! We had a lot planed this weekend and they joined right in. We made lifelong friends! We will be meeting with up them in future! If you get a chance to host them, please do! They are welcome back here anytime! 2nd visit with Matt and Susie, and it was just great.a really nice couple.had real good time with them, and would highly recommend them. THANKS FOR THE WONDERFUL PIZZA AND MUSIC. It was a joy to have Susan and Mathew here. Their dog is quite mellow and managed to make friends with our barn cat. Good folks to host, they are welcome back anytime. We really enjoyed Susie and Matt visiting us. They are so friendly fit in well with the other boondockers and our friends. We had a meal, camp fire and some great guitar playing and singing. They had their own boat and enjoyed the river. Their dog Sage was a wonderful guest also. We are really hoping we can get together again with them either here or in their home in Nova Scotia. Safe travels Susie and Matt until we meet again. I enjoyed their stay and hope they enjoyed it as well. They have a well behaved dog which I also enjoyed hosting. They are welcome to stay here again. Their stay was brief but we enjoyed having the winesprinters! Excellent, self sufficient guests that we enjoyed talking with, albeit brief it was nice to visit with them for awhile. Really enjoyed there visit. Super nice couple,and enjoyed the evening music and tall tales from Nova Scotia. Look forward to a possible visit to there hide a way. Enjoyed having them with us. I only got to spend a few minutes visiting with them but a lovely couple. We look forward to boondocking with them in the future when we start our journey. Awesome people - Awesome site! How can one rate something when superlatives are insufficient? Wonderfully peaceful and beautiful location with the best hosts one could possibly imagine! They invited us to join their friends and we all had spirited discussions. Matthew broke out his guitar and we had a singalong. Thanks for everything! 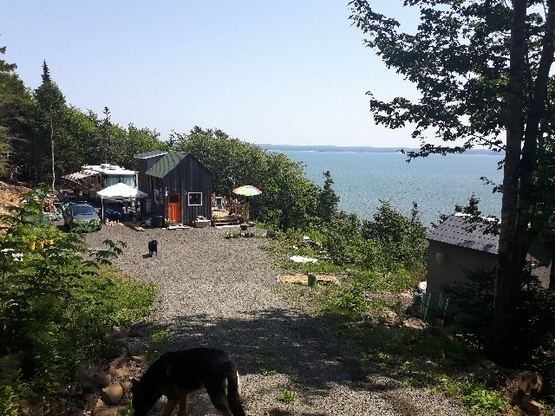 About as far as you can get off the beaten path on Digby Neck it this wonderful off grid home on the hilside overlooking the sound. We enjoyed wine and cheese on their deck along with wonderful conversation lasting into the evening. Our hosts were gracious and after a few minutes we felt right at home. You will need to enjoy a twisting gravel road with a steep decent to their home (or a less steep path to their secluded upper parking spot). Smaller rigs will feel more comfortable but they have their own 30+ footer parked on the lower level so you can do I with that sized rig. The view from the deck is spectacular and the hosts became our fast friends. Thank you for the fantastic visit, we hope to meet up again. The Winesprinters were great hosts that shared their beautiful place with us and generously shared lots of information about their fascinating set up there. We completely enjoyed ourselves and the meal we were able to share with them, not to mention fish fresh caught from the beach. Thanks so much! This was our first Boondockerswelcome experience and we could not have asked for a better one. Susie and Matt were wonderful hosts and, along with their great dog Sage, made us very welcome. Sitting on their deck looking at the magnificent view and sharing stories back and forth made for a delightful time. In the morning, led by Sage, we all strolled down the path to the beach and following that we sat around drinking coffee and learning more about their enviable off-the-grid lifestyle. We would recommend them to any Boondockerwelcome member who finds themselves in the Digby, Nova Scotia area. We look forward to the day when we can meet up with them again and share more stories. We really enjoyed our stay here. A very nice evening spent together. Could have talked all night I think. Like most BoonDocker hosts we've meet, they really enjoy being hosts. Thank you again so much, maybe next time we'll get to see your amazing view! Matt and Susie were excellent hosts. Became friends instantly! They introduced us to their friends and family. We had a terrific stay with Matt and Susie. The view from their home was beautiful. We had a nice quiet spot to park. We enjoyed visiting with them and enjoying their beach. They were a wealth of information. We consider them our newest of friends and would stay there again in a heartbeat. And of course, we can't leave out Sage - a super sweet dog! They hosted us in September and they were top notch. Incredibly friendly people, they were great with our girls and showing us around. We had a couple of opportunities to swap stories and strategies on camping and even for their tiny house. The location was really cool too. Can't say enough good things about these two. Beautiful place to boondock with very informative and kind hosts. We were assisted for parking our rig upon arrival and invited to their home on a couple of occasions. Very lovely couple. We highly recommend this spot. If you get a chance, make sure you meet Susie and Matthew! Meeting this couple will stand out for us as a highlight of our time in Nova Scotia. 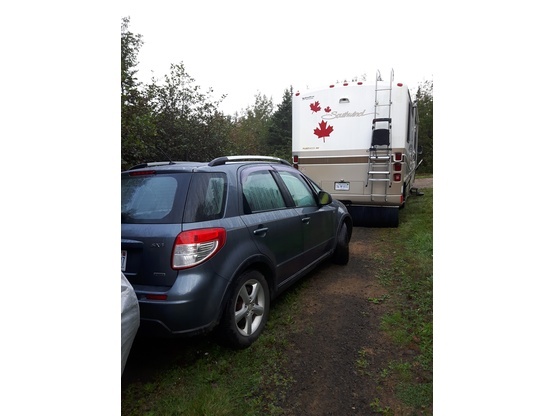 We managed to put our 35 foot coach in the space provided and proceeded to enjoy the "neck" of Nova Scotia and scoot down to Yarmouth in our tow car. Sometimes it's so nice to not have to move the big coach. Their off the grid life is intriguing and you can't beat their view of the bay. Can't thank them enough for being our hosts. We felt most welcome with Southwind_WineSprinter's friendly hospitality. The private off-grid site in a coastal Nova Scotian treed area is still cleared enough to let the sun and breeze in. Thanks for the relaxing stay. My wife and I very much enjoyed our brief stay with them on our way to Newfoundland. They have an awesome site and are enjoying life off the grid. We wished that we could have stayed longer. We enjoyed their location and the walk down to the beach. We hope to see them again in the near future! Had a great 2 night stay while we explored the area; couldn't have asked for better hosts! Hope to return the favour in the future, thanks again!! when you search for peaceful and lovely people htis will be your place to be <3 from where you stay you have a beautiful view on the atlantic. you walk a few meters down to their "own" beach. we had so interesting themes we spoke about. their dog is soooo friendly and cute. all in all this were 3 perfect days for us. our highlight was a small party at their neighbours were had had a few drinks with other incredible friendly peoples and guitar sounds from matthew. Our hosts in Windsor were so fun. Gave us a great recommendation for pizza and haircuts! I got a massage and took a Yoga class a few blocks away at the Windsor Mall, and took a nice walk on the waterfront too. Thanks! Our hosts provided a wonderful site to stay and explore the Winsor area. Can't say enough about their hospitality, including the delicious homemade wine they shared. Their dog, Sage, can sure steal your heart! Hope to see them again sometime. They responded within the hour to my request for a place to park. The location is great--just a block off the main street and easy walking distance to shops and restaurants. They are a lovely couple and their dog Sage did steal my heart. I would love to visit them again sometime, I feel we became friends in a very short time. With only a few hours notice and although they were away themselves, our hosts offered to let us stay. Their home is conveniently near the main street. We enjoyed a pleasant walk exploring the lovely town and a quiet sleep. Our only regret is that we didn't get to meet our hosts. What à nice stop we had at WineSprinter's place! Very kind people, receptive, interesting and warmful. We felt very welcome at their place as if we were old friends. We strongly recommand a stop at WineSprinter's if you go to that beautiful région of Nova Scotia. Thank you WineSprinter!